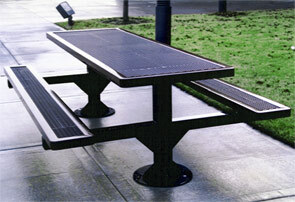 8" and 10" Thermoplastic coated rectangular picnic table with expanded metal top and seats. Mounted on two 4" square pedestals for extra stability. Available in the color options shown below. ADA Models have One 2' Overhang. For extra safeguarding, optional accessories include Sleep Inhibitor Bars for both tops and seats to prevent unwanted misuse of this rectangular picnic table.